Despite repeated promises and the sworn testimony that is anything said to Andy Cohen, the Wet Hot American Summer sequel is still not a thing, though there is a partial reunion in store. 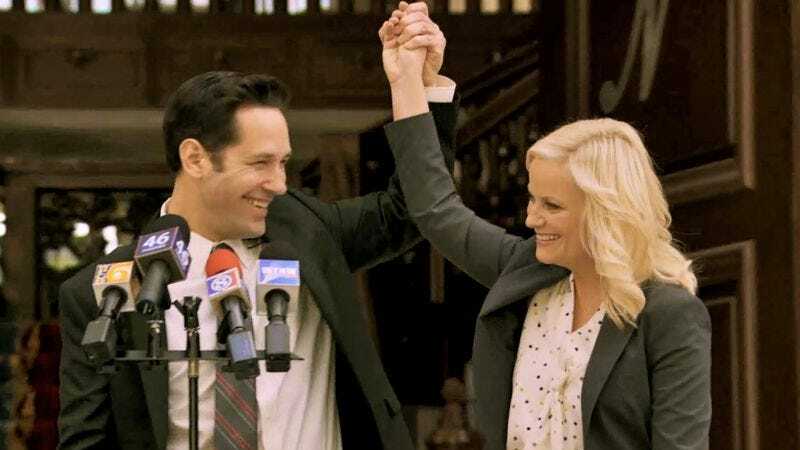 Paul Rudd and Amy Poehler will extend their recent Parks And Recreation rendezvous with They Came Together (double entendre probably implied), a parody of romantic-comedy tropes from David Wain and Michael Showalter in which Rudd and Poehler will play the seemingly diametric opposites who fall in love then out of it again, just in time for the third act. According to Variety's description, the movie is almost a direct satire of You've Got Mail, with Rudd playing the Tom Hanks-ian nice guy who's nevertheless a corporate stooge, and Poehler playing the quirky knick-knack storeowner who falls victim to his corporate stooginess. But it's also a montage mockery of standard-issue rom-com elements like jealous ex-girlfriends, intimidating in-laws, and "beautiful shots of New York City in autumn," rounding up all the leftover things Showalter didn't get around to with The Baxter. The announcement doesn't yet say that the cast will be filled out with State alums like Ken Marino and Michael Ian Black, but that's probably implied.